Bai Shaotong, deputy general manager of China National Machinery Industry Co (Sinomach) took part in a China-Cambodia business forum in Beijing on Jan 22. 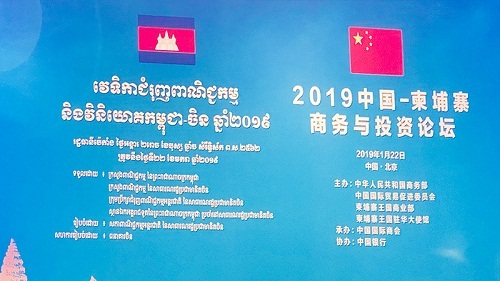 The forum, which aimed to promote Cambodia as an investment destination, was organized by China Council for the Promotion of International Trade, the Cambodian embassy in China, and the commerce ministries of both countries. It was also attended by Cambodian Prime Minister Samdech Techo Hun Sen, Chinese Vice-Premier Hu Chunhua and nearly 800 government officials and business leaders from the two sides. The China-Cambodia partnership has produced a wide range of benefits for both countries since the establishment of diplomatic ties in 1958. As a key member of the Belt and Road Initiative, Cambodia is a vital market for Sinomach in Southeast Asia. At present, the company is operating 28 engineering projects in the country, with a total contract value of $170 million. Among them are a power station, a national stadium and a hospital, all of which have brought a multitude of benefits to the local population –– by raising living standards and improving infrastructure.